Ai Weiwei’s Pots and Jean-Luc Godard’s Celluloid. While Ai Weiwei’s work with pots represent the artist’s more accessible work, there’s something about his actions and decisions with the, often expensive and historically relevant, pots that seem weirdly cinematic. This isn’t to say that they look like something out of a film (though actually they could easily work as something surreal given the right audience) but that the ideologies behind the works have been explored in cinema before Weiwei had even moved to New York. The idea begins with Weiwei’s famous triptych Dropping a Han-Dynasty Urn (1995). The mere idea of this seems almost inconceivable in the last decade of Christies/Bonhams madness, with objects being given a status far and above the people who originally created them. Weiwei’s piece attacks this in the most joyfully absurd manner but also highlights the often overused cliché of “creation through destruction”. Where this becomes cinematic is interesting. In effect, just about any movement given the title of “new wave” could said be exhibiting similar leaps forward through acknowledgement and disaffection of the past. A number of critics have argued that, in spite of the cinema’s almost instant attachment to experimentalism and surrealism, it was Jean-Luc Godard whose work completely destabilised the Hollywood/commercial bauble, to the point where cinema inverted into what could very loosely be described as a post-modern cacophony. In this sense, Godard is the first filmmaker to tie in to Weiwei’s thinking of the past (though this if of course anachronistic). When À Bout De Souffle came along in 1960, it was very obviously using the raw materials of cinema before and even around it such as the tail of end film noir and even Hollywood’s golden era. À Bout De Souffle does not sit with the films around it though and seems more like Weiwei’s triptych in that through watching Godard’s film, the viewer is watching an older form of cinema being literally taken apart. Godard is of course affectionate to his pot (Belmondo’s admiration for Humphrey Bogart for instance) but this isn’t simply about wanton destruction but instead about processes. The pot and the language of cinema is not being cut up and smashed simply because of dislike. If there is any hint of dislike, it is a natural aversion to the worlds around them, namely that of the moneymen and their values. What Godard’s early cinema is also not, is the allegorical fragments of Weiwei’s smashed pot. This is purely about process in this instance and the desire for creation through a very literal abolishment of the past is one of the French New Wave’s contradictions. If Weiwei had smashed the priceless urn as a performance piece, it would have heralded an ultimate simply because it would have even removed that final interest in the process. The action would have been all there was to define it and any sharing of the action would have had to have been through word of mouth. This slight contradiction with recording the action to show it as a process is inherent in lots of cinema; especially of those who wish to violently ignore and go against so called conventions. New Waves will always look back in order to define themselves to the contrary while Weiwei has recorded his smashing of the urn to prove he is to the contrary. The major difference being that Godard’s films didn’t change the possibilities of what had gone before while Weiwei’s actions had. This at least explains the contradiction and makes it logically plausible. These actions become more apparent in Weiwei’s painting of genuine Neolithic pots. Coloured Vases (2006) shows ten genuine vases from between 5000 – 3500 BC painted with normal household paint and left to drip. However, with this piece, the parallels between cinema and art become vaguer, especially in terms of Godard. Cinema is very often extremely hard to change once there, especially in the digital age of file sharing, YouTube and DVDs. For Godard to have found an equivalent, he would have had to have permanently changed a classically regarded film so that the only possible means of viewing it would be to view through his changes. His destabilisation of cinema was forward thinking and not concerned with the present or past destabilisation. Weiwei perhaps has more prominence then, unburdened by the limitations of the popular cinematic medium. Films such as Pierrot Le Fou (1965) and Le Mépris (1963) do much to destabilise the future potentials of the cinematic form but do not, for example, change the work of Fritz Lang or Samuel Fuller (both of whom make appearances in the films). The last example of Weiwei’s pots is slightly simpler to connect to cinema in that it is born from issues consistently addressed; those being globalisation, commercialisation and even Americanisation. 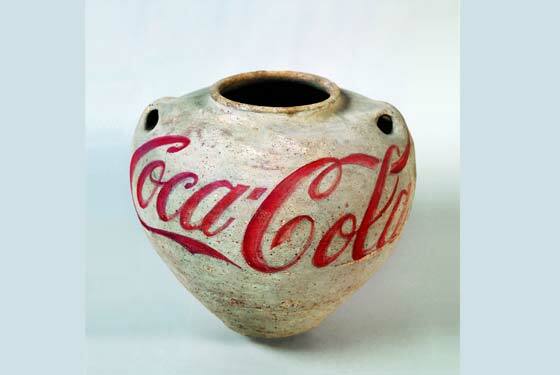 Coca-Cola Vase (1997) again uses a priceless urn as a canvas for showing the crass, almost unconscious determination of brand capitalism to invade all aspects of life and culture. 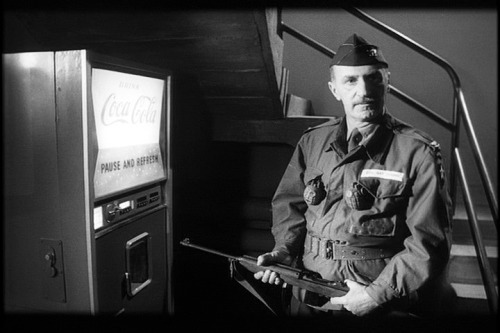 It is reminiscent of the very famous line from Kubrick’s Dr Strangelove (1964) when a soldier warns Peter Sellers’ Group Captain that “you’ll have to answer to the Coca-Cola company.” after breaking into a machine for change to make an important phone call concerning nuclear war. Weiwei marks out the absurdity of brand advertising but also shows its lack of moral levity. Godard also increasingly went towards this ideal, especially in his more socialist films such as Le Chinoise (1967) and Tout va Bien (1972). While Godard doesn’t use the print of a rare, unseen film to record his films on, he is still re-appropriating traditional forms such as drama and cinema for his own ends in the same way that Weiwei is doing, only in far more extreme and physical forms. To summarise, both Godard and Weiwei seek to highlight more than anything else, as if recognising the illusion of corruption and power created by single pictures means an inevitable end to the spinning of the Zoetrope, perhaps somewhere in the not too distant future; even at the cost of breaking a few pots along the way.